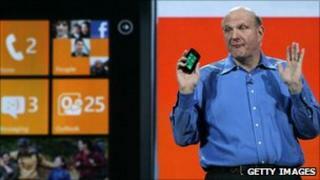 Microsoft has said that Yahoo is behind the mysterious "phantom data" leaks affecting Windows Phone 7 handsets. The glitch, which was first identified at the start of the year, makes many phones send and receive data without the owner's knowledge. Some users had complained that the bug was rapidly eating up their monthly data allowances. Microsoft, which had previously refused to name the culprit, said it was still working on a solution. News of the problem first surfaced at the beginning of the year, with some Windows Phone 7 owners reporting that their phones were using huge amounts of data each day for no apparent reason. Most of the complaints came from the US, with a slew of notices from subscribers who suddenly found their data allowances had been eaten up. Last week Microsoft said it had pinpointed the source of the leak, but in a statement last night it finally confirmed that Yahoo was responsible. "We have determined that an inefficiency exists in the synchronisation of e-mail between the Windows Phone mail client and Yahoo Mail," it said. "This inefficiency can result in larger than expected data usage for a very small percentage of users." The glitch apparently exists in the code which tells Windows Phone 7 how to fetch new messages from Yahoo Mail, one of the world's largest free e-mail services. The error means that the system downloads up to 25 times more information than it needs to. Microsoft says it is in contact with Yahoo, and should be fixing the problem in the next few weeks - but now critics are questioning why it took so long to admit the identity of the source. The admission that it was a problem with Yahoo came only after blogger and programmer Rafael Rivera forced the company's hand by uncovering the source of the leak. In a post yesterday, Rivera announced that he had found the phantom data culprit and outlined the nature of the problem - which he called "shocking, but not surprising". Last year Microsoft - which had tried to buy Yahoo in 2008 - signed a ten-year, multi-billion dollar deal with its Californian rival to provide results for its search engine. "There's no reason, and no excuse, for this information to not have been provided earlier," said Paul Thurrott, a prominent blogger on Microsoft and author of the forthcoming book Windows Phone Secrets. Windows Phone 7 was launched in October 2010, and is seen by many as the company's first serious challenge to rival operating systems from Apple, Google and BlackBerry maker Research in Motion. Yahoo did not respond to a request for comment.